The Dividist Papers: DWSUWF Returns & The AMT rises from the grave. The AMT rises from the grave. I'm back. Actually, Mrs. DWSUWF and I got back from our month long Sahara adventure over ten days ago. Yes, that is me pictured with some new friends I made in the West Africa desert a few weeks ago. It was the trip of a lifetime and, frankly, since returning I have been more interested in transcribing our travel journal/photos, rather than wading back into domestic politics. Anyone interested can find more than you want to know about our trip on the mobile blog or if you are just curious about my new friends, that story is posted here. "Getting rid of the AMT is an important incremental step in the right direction. Rangel's bill accomplishes this in a fiscally responsible manner, even if the top ten percent must pay a little more to finally put a stake through the heart of this undead bloodsucking tax code vampire." "Bush also complained that legislation to protect middle- and upper-middle-class families "from the burden of the alternative minimum tax" came so late that it was likely to slow the processing of tens of billions of dollars in tax refunds. "When Congress wastes so much time and leaves its work to the final days before Christmas, it is not a responsible way to run this government," Bush said." On Tuesday, the Senate rejected a House-passed AMT patch that would have covered its cost by closing offshore tax havens used by hedge fund managers. The Senate earlier rejected a House plan that would have increased the tax rate on managers of hedge funds and private-equity firms." It's a band-aid, not a cure. The AMT vampire still walks the earth sucking the lifeblood from middle class taxpayers. The patch is the equivalent of putting garlic around the neck of some 2007 taxpayers to keep the undead AMT ghoul at bay, just to let it slake it's blood thirst on other unprotected 2007 middle class taxpayers. And in 2008??? "Congress next year must patch the AMT again or force millions of families to pay more tax. The patch's revenue loss then will rise to $65 billion, an amount that Andrew B. Lyon of Pricewaterhouse Coopers said would be "extremely difficult" to raise." Net net: The same number of people who got screwed by the AMT on their 2006 taxes will get screwed again on 2007 tax returns. The AMT problem has simply been pushed out of sight/out of mind over the November, 2008 election horizon. It will have to be addressed again (or not) next December after we have elected a new President and Congress. This shell game is what we got from tRepublican obstruction in the Senate instead of putting a stake through the heart of the AMT now and paying for it from higher taxes on Hedge and Private Equity funds/managers. The middle class still carries the load. And GWB and the Republicans in the Senate seem to think that this is somehow a superior solution because ?????? You got me. Whatever. The GOP needs a lot of help. I'll see what I can do. It'll take me a while to ramp back up, but I should have DWSUWF back in full focus when we get past the holidays and in time for the Iowa/New Hampshire returns. 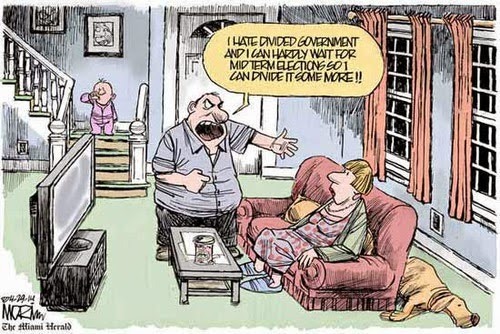 In the meantime, what better way to wade back in, than an all new Carnival of Divided Government? In honor of Bill O'Reilly winning the war against Christmas while we were gone, we'll be publishing the latest edition precisely at the moment of the Northern Hemisphere Winter Solstice - tomorrow, December 21, 2007 at 11:08 PM PST. 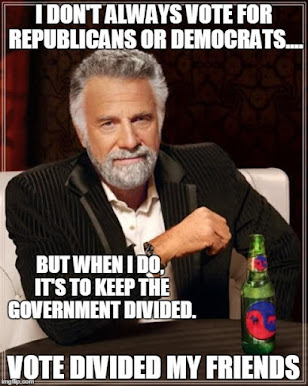 There is still time to get your submission in, blog articles may be submitted for the next carnival of divided government using the carnival submission form, but a reminder - if your post does not include the words "divided government" - don't bother. Technorati tags: divided government, AMT, 2008 election,libertarian,Democrat,Republican, George Bush, Charlie Rangel,tax,Congress.